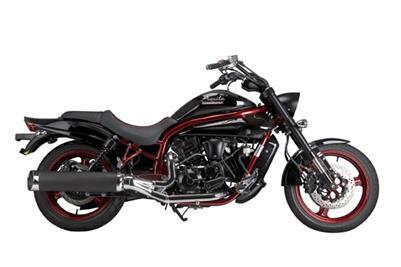 It's been 30 years since Hyosung motorcycles was founded in South Korea and, to commemorate the milestone, a limited-edition version of the popular GV650 cruiser has been released for the 2008 model year. Relaxed riding position with all the essentials - Digital instrument panel features fuel and temperature gauges, dual trip meters and convenient clock. 2008 Hyosung 30th Anniversary GV650. \* Editors Note - Image 4.8cm @ 300 dpi.